Long-time readers will remember my struggles with coming up with a good idea for a horror-related article about Chanukkah (and Kwanzaa, for that matter). Although I’m still clueless about what to do for a Kwanzaa article, I wound up stumbling across something that blew away my original idea for an article about golems. For you see, my reading through the Wikipedia entry for the holiday lead to me seeing a painting of a woman holding a severed head! Although it wasn’t the same one used in this article (Judith with the Head of Holofernes by Lucas Cranach the Elder), Cristofano Allori’s Judith with the head of Holofernes was a still an attention grabber. As it turns out, there’s a minor Chanukkah custom of eating cheese and other dairy products that is linked to the story of Judith and Holofernes. According to book of Judith (“Yehudit” or “Yehudis” in Hebrew), Bethulia was under attack by the Assyrian general Holofernes and his men, who strengthened their control by blocking of the village’s sole supply of water. Things were looking very bleak for the inhabitants, until a widow named Judith approached the village elders with a plan. She would go to Holofernes while pretending to be someone sent by God to aid him until she was able to lull him into a false sense of security and do away with him. Needless to say, the plan worked perfectly and the general was smitten by the beautiful stranger. After spending three days at his camp, Judith feed him wine and cheese until he fell asleep. Seizing the opportunity (and the man’s own sword), she quickly cut off his head and secreted it out of the camp. 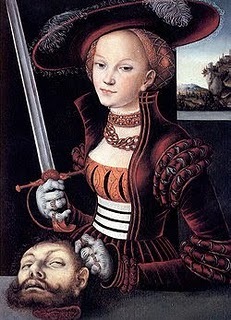 Some accounts claim that she was assisted by her servant, apparently done to differentiate the story from that of Salome, which is similarly decapitation-based. In any case, Holofernes’ men were demoralized by his death and the sight of his head inspired the villagers to drive off the invading army. Now, despite the fact that the book of Judith is deuterocanonical (not a part of the Hebrew bible and is thus “non-canon”), some sources credit Judith’s actions with allowing women to be included in the obligation of lighting candles for Chanukkah. In any case, the account is very popular and has inspired numerous works of art in addition to the previously-noted traditions. Come to think of it, this also makes the Local horror-themed nickname for Chanukkah more appropriate than originally thought.